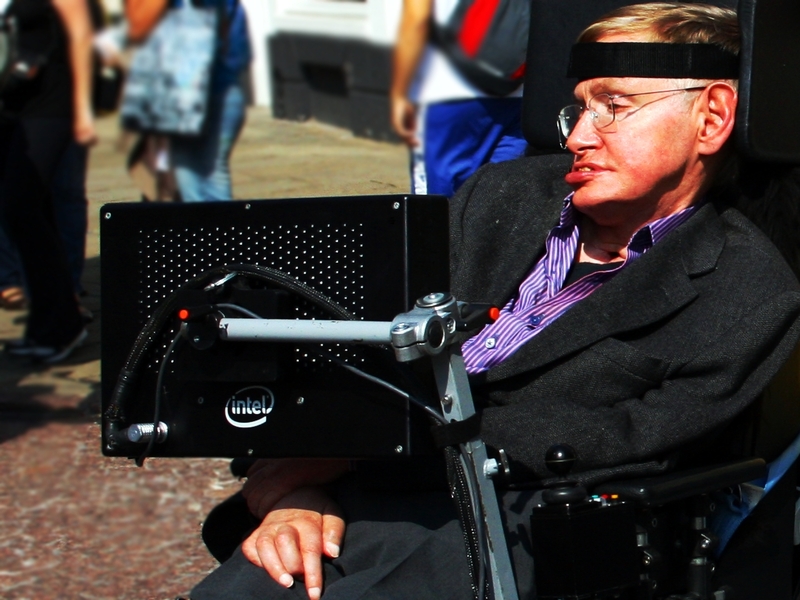 Most Americans have heard of Stephen Hawking. His books have made him a pop culture phenomenon. So has the story of his triumph over Lou Gherig’s disease, the muscular disorder he’s had for 50 years that typically takes its victims in two to five. But it was Hawking radiation, his theory that black holes aren’t completely black that set off his launch to stardom. Black holes are objects in space so dense that nothing, not even light, can escape the pull of their gravity. Gravity is the force that keeps us glued to the earth, and the denser something is, the more gravity it has. Gravitational attraction happens because denser things actually distort the space around them. A canoe may float in straight lines down a river, but if there are rocks in the way, the river’s current will meander around the obstacles and cause the boat’s path to bend. If the rocks were a star, the boat would be a planet or even a beam of light, and the river would be like space itself. Now replace the rocks with an interstellar Charybdis, an infinitely deep whirlpool so powerful that at a certain distance, not a single ship, no matter how fast, could outrun the vortex’ vicious pull. That’s a black hole. Since black holes are so dense that light can’t escape their force of gravity, they should be pitch black, impossible to see. Not true, suggested Hawking in 1974. A wacky set of physical theories says that if you try to zoom all the way in to look at the tiniest particles, you won’t be able to focus the camera. Everything is a blurry mess, like white noise, where things are constantly created and destroyed from nothing. An electron, for example, can appear out of nowhere if its evil twin, the positron — the same particle but with the opposite electric charge — appears alongside it. Since opposites attract in physics, the particles crash back together and disappear in a burst of energy. But, Hawking thought, what if the two particles appeared on either side of the point-of-no-return of the black hole’s pull? One particle would meet its demise inside the black hole, while the other would have just enough will to escape. Those lucky particles overcame the black hole’s oppressive gravity and appear as an extremely faint glow — one that we might be able to measure. That glow is now known Hawking radiation. Scientists argued (and still argue) over Hawking’s theory when he introduced it in 1974; imagine being told that the universe’s best vacuum cleaners actually create and spit out a layer of dust. Today, however, researchers at CERN (the International Center for Nuclear Research) in Geneva and NASA are trying to find signs of the radiation, and scientists celebrate Hawking for weaving the heaviest black holes and tiniest particles into one single theory.